The 1950s found Alfred Hitchcock in his prime. Freed from both the shackles of the British studios and the meddling of David O. Selznick, he was finally free to make the films he wanted to make, exactly the way he wanted to make them. This period yielded many works which have become cemented classics - Strangers on a Train, Rear Window and North by Northwest. 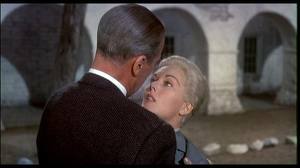 But Vertigo is arguably his finest work, being unbearably suspenseful and the greatest depiction of obsession in all of cinema. 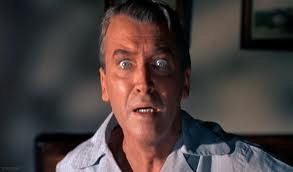 Although it was received mixed reviews when first released, Vertigo is now recognised as a highly influential work on filmmakers. Individual directors have paid tribute in their own way: Martin Scorsese has waxed lyrical about it in interviews with the AFI, while Mel Brooks used it as one of the main bases for his affectionate parody, High Anxiety. Its impact on the horror and thriller genres is plain to see, influencing films as varied as Single White Female and Mulholland Drive. 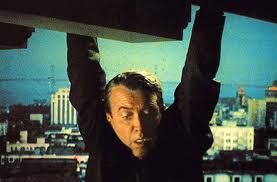 The ironic thing in all of this is that Vertigo is not a characteristic Hitchcock film. It does not conform, at least not entirely, to the various tropes and conventions which we now associate with Hitchcock. Most of his thrillers are driven by narrative: the story is everything, and the characters involved in it are there only to advance the story in which they find themselves. 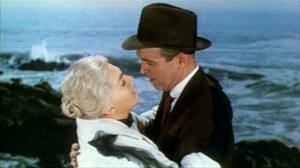 Vertigo is more of a character study, with the narrative and much of its complexity deriving directly from Jimmy Stewart. 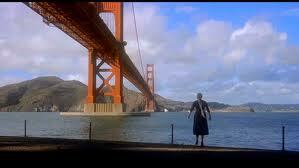 Hitchcock described Vertigo as his most personal film, and it isn't hard to see why. Apart from the artistic freedom that he enjoyed making it, much of the film is self-reflexive: it is about his approach to filmmaking and especially his attitude to women. Hitchcock famously remarked that actors should be treated like cattle - being pushed and prodded around, told what to do, with someone else doing all the creativity. This approach is writ large in Vertigo in such a way that the characters mirror it directly. Scottie, played by Stewart, is Hitchcock, obsessively analysing people's motivations and behaviour, following them at length and attempting to mould them to look and act the way he wants. His dark obsession with Judy reflects Hitchcock's fascination with blondes: he wants her to be 'Madeleine', her character, because that it is the only version of her he cares about. But for all his hard work, no understanding is gained; the relationship is one of fascination, but never comprehension or satisfaction. A comparison can be drawn between Vertigo and Peeping Tom, Michael Powell's incendiary masterpiece from two years later. Both films have male protagonists who are obsessed with perfection, which they convey or project in their attitude to women. Both films are self-reflexive, shedding light on the relationship between a filmmaker and the actors who end up in font in his camera - a relationship which, in both cases, turns out to be fatal. And both are triumphs of their genre, which fulfil expectations in terms of terror and suspense while still feeling fresh and ground-breaking. A further similarity between the films is their extraordinary cinematography. 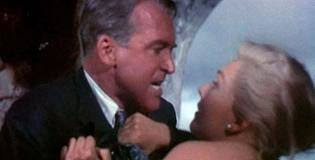 Robert Burks collaborated with Hitchcock extensively between Strangers on a Train and Marnie, and his mastery of Technicolor is on a par with Powell's old master, Jack Cardiff. The recurring deep, passionate reds are as dazzling as anything in The Red Shoes, and are complimented brilliantly by the piercing, threatening blues of the New Mexico skyline and Stewart's purposeful eyes. 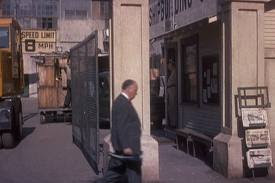 The film invades your senses with its manipulation of colour, with every shot brimming with menace and intent. Equally impressive are the dream sequences. These are better integrated than the dream sequence in Spellbound, famously directed not by Hitchcock but by Salvador Dali. Hitchcock may not have the literacy of Dali when it comes to Freudian imagery, but the effects are impressive for the day. 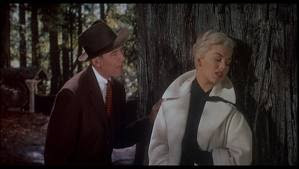 Better still is the image of Kim Novak as Judy emerging as 'Madeleine' - she appears to shimmer as fantasy and reality attempt to merge into a macabre fairy tale, to the internalised delight of Scottie. A further highlight of the film is Bernard Herrmann's soundtrack, perhaps his best and arguably his most famous other than Psycho. As Scorsese observed in an interview with Sight and Sound, the score is built in spirals and circles, mirroring the obsession of the character as he keeps coming back to the same point. The score is ever-present but not intrusive, perfectly judging every scene and never doing the work for the actors, as can often happen in melodrama. But what makes Vertigo ultimately so suspenseful, and so successful, is its confidence and attention to detail which is present in every aspect. Everything about its plot, its character construction and execution of suspense has been meticulously figured out, and yet it still has the ability to keep us guessing and genuinely surprise us at each turn. There are few thrillers which are so confident about the strength of their twist that they feel the need to withhold it for so long and so willingly. The twist when it comes is an absolute belter, rewarding our attention and pulling us further in. If Peeping Tom is the cinematic Bible on voyeurism (with Blue Velvet a very close second), Vertigo is the accompanying volume on obsession. It shows with great detail and intelligence how unhealthy fascinations can start with something so small, and grow almost beyond the host's control until they have consumed everything else. Scottie takes the snoop job as an innocuous favour to an old friend; the first sight of Madeleine plants into his mind a seed of sympathy, a desire not to see her harmed. From the moment he has saved her life, this desire grows into fascination, to the point where he cannot imagine life without her (hence his silence at the sanatorium). The story of Vertigo is a further reflection of obsession. We are made to study the characters, asked to decipher their every facial tic until we too are in danger of becoming obsessed with them. The twists and turns that occur make us simultaneously elated and frustrated - elated at what truth they reveal, frustrated that we could not spot them sooner. Both the characters' story and our experience of it end as they began - with one big shock which cements these emotions. 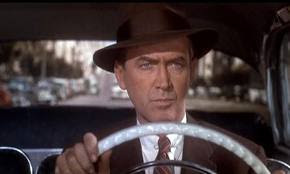 Jimmy Stewart was blamed by Hitchcock for the film's failure when first released. Hitchcock thought the age gap between Stewart and Novak was too obvious, and the two never worked together again. In hindsight, it was a triumph in conveying the theme of a seemingly innocent man being manipulated and corrupted - a process which he both resists and encourages. Stewart, once the wholesome leading man in Mr Smith Goes to Washington and It's A Wonderful Life, is transformed into what is arguably the most skin-crawling character in 1950s cinema. It is a masterclass in subtle madness, and remains his finest performance. 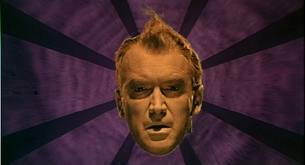 Vertigo is a terrifying triumph in every aspect of its execution. Hitchcock's subsequent efforts saw his abilities gradually diminish, but here the master is at the peak of his powers. The story is complex and rewarding, and the atmosphere which Hitch creates through lighting, music, colour and composition, is unbearably tense. Like Mulholland Drive more than 40 years later, Vertigo will pull you in to its dark, troubled world until you are unable and unwilling to escape. If you come away from this review convinced that I am obsessed, it means that the film has done its job. The text in italics needs fixing up. Not sure if it is just my computer being a prat. But other then that great review for a Hitchcock classic.